Whether it’s a blanket fort in the middle of the living room on a rainy day, or turning a cardboard box into a castle, kids love building forts. 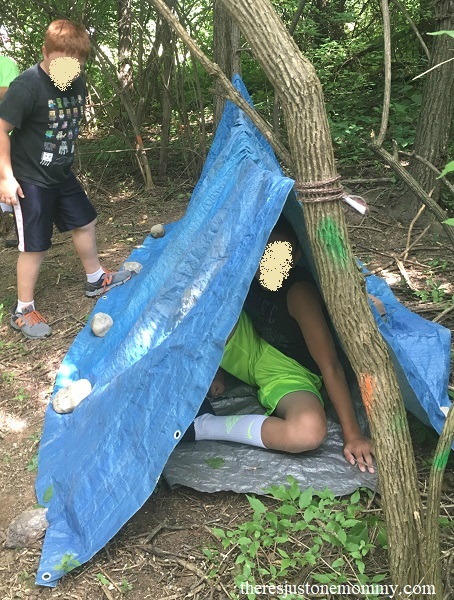 In fact, building a shelter was a huge hit with all the kids when it came to survival skills activities at our backyard day camp this summer. Edit to add: The kids enjoyed this STEM activity so much, they asked to do it again. 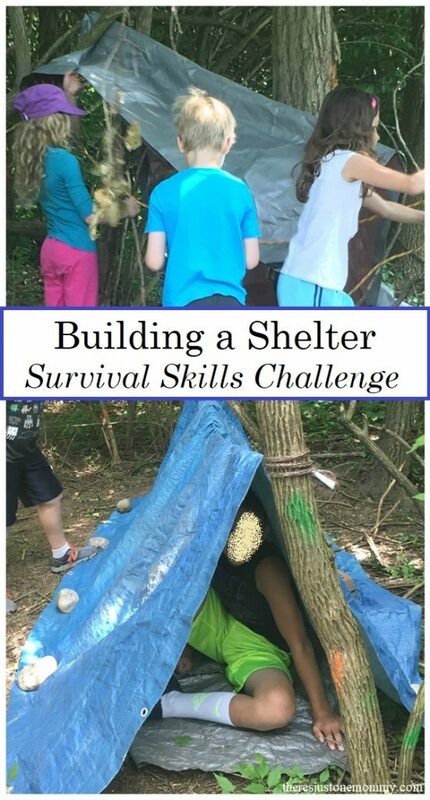 This survival skills activity can be done with a wide range of ages. 4-5 year olds can work with older team members by giving suggestions and gathering materials. Once the shelter is complete they will enjoy using it for pretend play. 6-10 year olds will have fun experimenting with how to use the materials to build the strongest structure. They might try placing it in a variety of locations, raising and lowering the tarp, and angling the tarp different ways. Older kids will get more creative. You may even want to see what types of shelters they might come up with if you don’t provide them with all the suggested materials. What if they don’t have the rope? Or, if you provide them with nothing,will they make a lean-to with fallen branches and leaves? Set up a solar still with the kids ahead of time and let it start working while the kids are building their shelters. This activity works best in a large area, preferably one with plenty of trees. A campground or park works well, but be sure to be courteous to others. This means taking down the structure before you leave and not destroying the local plant life by cutting tree limbs, etc. We are fortunate to have a small wooded area next to our house that worked perfectly for this activity. If you can’t find enough trees, you may need to get creative. Think picnic tables or taking the swings off your back yard swing set and letting the kids use the frame to help build their structure. If you are working with a large group, divide kids into groups of 3-4. This ensures everyone is getting to help build the shelter, not just watching it happen. 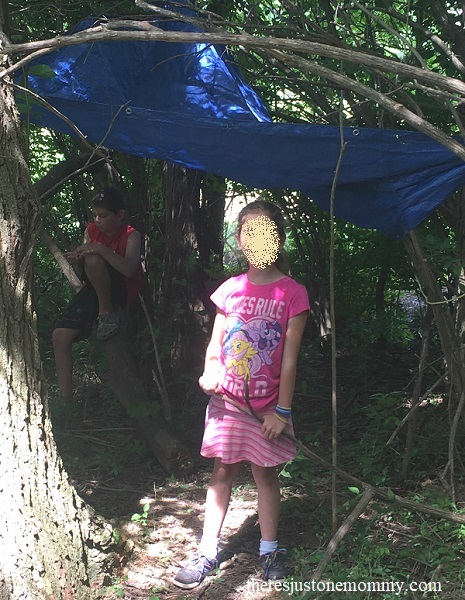 Then give each group their materials and plenty of time to create their hideaway. It’s hard, but try not to give advice or lend a hand to the groups when they start out. They may start off tying the tarp too low, or running out of rope. Let them make mistakes. Let them start over. It’s all about the process. I loved seeing how different each of the shelters were. 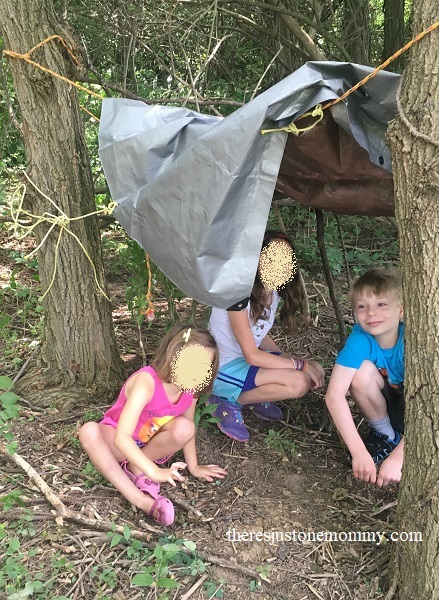 Building a shelter was a favorite at our backyard day camp. 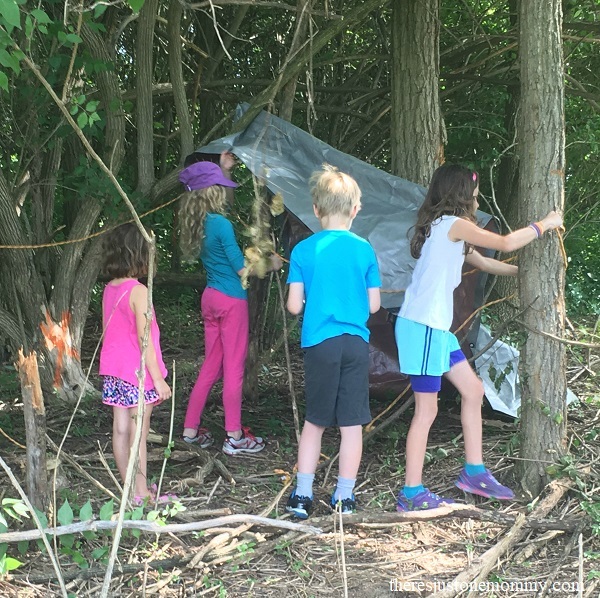 The kids returned to their forts throughout the day, checking on them, making changes, and playing. If you are doing this kids activity in your own backyard, I highly suggest keeping the structure up a few days. It’s fun to see whether the structure will stay up on a windy or rainy day. And it will provide endless hours of pretend play for the kids. Make a few tin can lanterns to go with it and take the pretending to a whole new level. 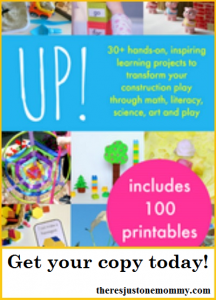 Subscribe to our email newsletter and get kids activities and crafts delivered to you twice a month.